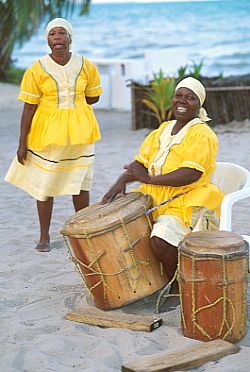 Garifuna, the language of Seine Bight Garinagu. Dügü is a feast for the Garinagu ancestors performed in the dabuyaba and presided over by a Garifuna buyei (buyeh). Cassava has to be planted and grown. "Onweha" is the verb meaning to go into a trance and act as a medium for an ancestral spirit. There is singing, drumming, and dancing. Each day must begin with a Mass and pray that the dügü will be successful, Ben Palacio. Garifuna, the language of Seine Bight Garinagu. Dügü is a feast for the Garinagu ancestors performed in the dabuyaba and presided over by a Garifuna buyei (buyeh). Cassava had to be planted and grown. "Onweha" is the verb meaning to go into a trance and act as a medium for an ancestral spirit. There is singing, drumming, and dancing. Each day begins with a Mass and all prayed that the dügü would be successful. DID YOU KNOW THAT? The road into and thru (through) Seine Bight was first called (named, known) Cull Highway. (It was so named) So name after (Fr. John Cull, S. J.) the first (a priest who first drove) Priest who drove into Seine Bight by driving thru the uncharted bushes and swamps of Riversdale, in a four-wheel-drive jeep, sometimes one set of tires in the sea then (with the) other set on the sandy shores. (Did you know that) The Seine Bight school system was established sometime in the 1900's. The first school building was built in the area of where the old school building is now located. It was built out of a thatched roof and blanks (cabbage, yaraüwa walls) made out of the bark of the cuhune (royal) palm tree. (That) The Belize's first Garifuna Education officer is (was) from Seine Bight. Yes, Mr. Cleophus J. Augustine is (was) from the "The Jewel Of The Penninsula". He is (was) also affectionately known as "Clay / Cle" (Cülei/Hoff) and Zum-gali. Did you know: That shortly after hurricane Hattie the first set of British troops by heliocopter LANDED in front of the old school with GUNS DRAWN "at the ready". Did you know that: The first known alcalde was a Mr. Thomas followed by Mr.Santiago Lambey. The next alcalde was Mr. Balbino Palacio who served three(3) two-year terms (6 years). Did you know Seine Bight Village alcaldes like all other alcaldes were appointed by the people. An alcalde was vested with the power to arrest & apprehend violators, hold tribunals, impose fines, community services or both. Did you know that in 1962 the British Honduras government under it's colonial rules set up the first Justice Of the Peace System. One Mr.Marcus Moreira was then appointed the first JUSTICE OF THE PEACE OF SEINE BIGHT VILLAGE. Did you know that our Seine Bight forefathers first settled at Jonathan Point also called All Pines until they were driven or expelled from there because they REFUSED to pay for the area on which they lived. They found the idea of paying for GOD's Land REPUGNANT. They rejected this stupid idea of paying for land. A white settler by the name of one Mr.Downner had bought the entire area and offered to sell them a peice. They REFUSED. He drove them off the land. These group of Garinagu traveled south way pass where Seine Bight is now to an area called Caribbal. For many years, relics of broken bottles, chinaware and building posts remained behind at the location as indication of prior human habitation. Did you know: That Seine Bight was once where Caribbal was until our ORIGINAL SEINE BIGHT SETTLERS WERE driven from there because they AGAIN REFUSED to pay for their lands. Instead the CARIBS baal (shouted) (( maybe it's why they call it Caribal. Did you know that: The first teacher was said to be a Mr. Marcello Arzu followed by a Mr.Simeon Samson, then by a Mr. Nicodemus Castillo. A small school building was built with the help of one bishop DUNN. 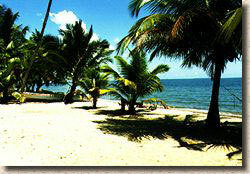 Did you know that: For a short time all the children from Placencia Village attended classes in Seine Bight. DID YOU KNOW THAT: Between 1965 - 1968 Seine Bight once had a credit union - called Gaines Credit Union. This was a small green and white house 300 yards north of the Hurricane Shelter on the west side of the street. One of the officers was Mr. Bonifacio Hill. Gaines opened onces a week on Wednesday evenings for all transactions. Gaines as far as I know was a subsidary of Holy Redeemer Credit Union in Belize City. DID YOU KNOW THAT: The darkest days in Seine Bight was one sunny Sunday morning in May 1961 when over a dozen peeople died over a 36 hour period. This was the Benzine incident. A gallon of what was believed to be consumable liquor drifted ashore Seine Bight and privately distributed and consumed among a select few. This sunny day quickly dimmed as this deadly vermouth almost immediately began claiming one victim after another. This deadly drink's first action is to severe the optic nerve rendering instantaneous blindness follwed by massive internal bleeding leaving it's victim in an almost catatonic and terminal state. Burials in Seine Bight were scheduled by the hour. Often, before one coffin was covered the wailings of other (new) mourners can be heard announcing another death or two. Men stood by the church bell to take turns sounding the bell in that Ever-So-Slow and distinct bone chilling, Death announcing bang, sending chills impregnated by fear of multitudes of untimely ghosts throughout the village. Providence only saved others such as my mother as they were denied access or admission for one reason or another to the private distribution process of this clear colorless mortal drink. My mother often relates how she was not admitted to one upstainrs wooden house where her group (Pu-lal-li-guna) (Pulali = a sweetish milky mini dumpling) where the ladies of Pulali meets for singing practice. The Pulali group had been a given a quart of this vermouth for the consumtion of its paying members. 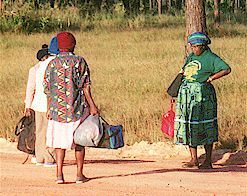 Members of the Pulali group (all ladies) were obligated to pay 25 cents a month to remain current. Because my mom was one month behind, yes, she was behind by 25 cents .... she was denied admission at the door. She relates how she remembers each step she took as stepped down each rung of the steps. The half dead or half living rushed to Stann Creek and often didn't make it. In some cases one or more members of the same family died hours apart. Emergency medical response from leaders of government was anemic at best. After these dark days bottles drifting ashore were heavily scrutinized. It may not be late to research marine records to find out which negligent ship or liner that was the source and seek legal remedies. Alessandro d' Medici, (il moro) so called because of his swathy complexion, believed to be the son of Pope Clement VII (Giulio de' Medici), was a mulatto born to an African mother. His ascent to become Duke of Florence (1523-1537) was aided by the Pope, which raised the suspicion of the Florentines that he was indeed the Pope's son.